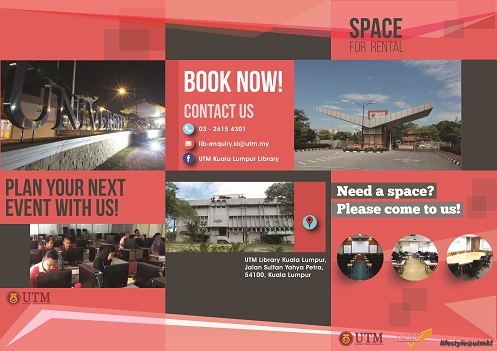 UTM Library Kuala Lumpur is strategically located in the heart of Kuala Lumpur with only 10 minutes’ drive from KLCC or well known as The Petronas Twin Towers. Besides a place for study with vast of book collections, we also offers facilities for seminar or any event to be conducted at our place. 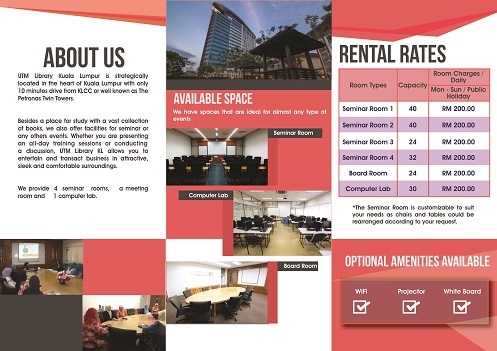 Whether you are presenting an all-day training session or conducting a negotiation, UTM Library KL allows you to entertain and transact business in attractive, sleek and comfortable surroundings. 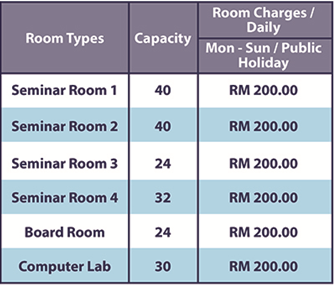 We provide 4 seminar rooms, a meeting room and 1 computer lab that can accommodate 30 people. * The Seminar Room is customizable to suit your needs as chairs and tables could be rearrange as request.